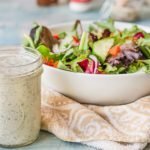 If you are looking for a most delicious, low carb and dairy free homemade ranch dressing recipe, I'v got one for you! This is full of flavor and at only 0.3g net carbs per tablespoons, you can go to town on your salads. Add all ingredients to a large bowl and whisk until well combined. Can also put into a food processor or blender.